ST. LOUIS—Defects on the 50-year-old skin of the nation's tallest monument are no more than age spots and birth marks and do not signify any structural damage, a new engineering inspection concludes. 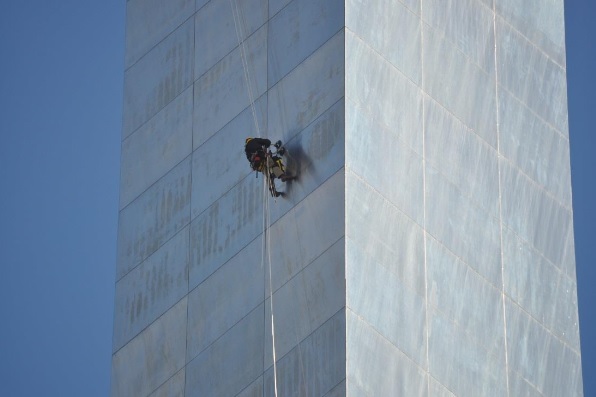 Discolorations and blemishes on the stainless-steel exterior of the St. Louis Gateway Arch reflect no "significant corrosion or distress"—but a little careful cleaning of the structure couldn't hurt, concludes WJE (Wiss, Janney, Elstner Associates Inc.) of Chicago. The third and final analysis of surface corrosion on the monument has declared it structurally sound. 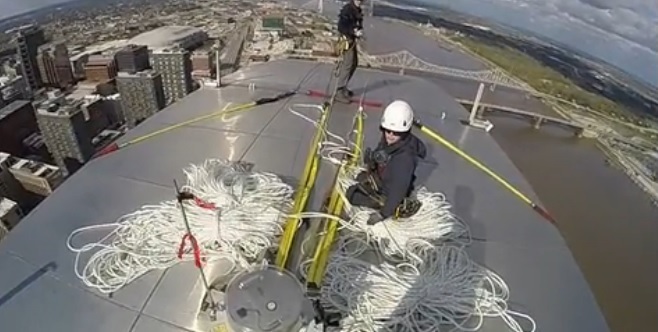 Engineers atop the St. Louis Gateway Arch prepare to repel down the 630-foot-tall steel legs to inspect for corrosion and surface defects in October 2014.
deterioration," concludes WJE's 315-page report, Gateway Arch: Corrosion Investigation Part III, prepared for the National Park Service and released April 3. The analysis includes archival research, laboratory analysis, cleaning trials and field data gathered during a meticulous rappeling inspection of the structure in October 2014. The monument has been the object of intense scrutiny—by the Park Service, engineers and the public—for about a decade, due to the appearance of surface discolorations, staining and corrosion along the massive legs of the catenary arch, which is 630 feet tall and 630 feet from leg to leg. 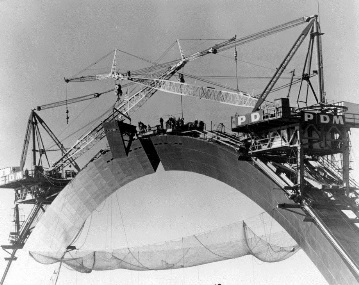 The final segment of the Gateway Arch was installed Oct. 28, 1965 (right). 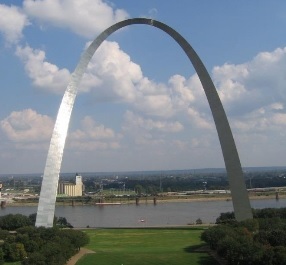 At 630 feet tall, the Arch is the tallest monument in the United States. The structure has a carbon-steel interior skin and stainless-steel exterior skin. The carbon-steel interior of the monument has been coated, but the exterior has never been coated or even cleaned. Designers and builders in the 1950s and 1960s felt no coating was needed and recommended cleaning every 50 years. The structure opened in 1967. The practice of tourists carving their names into the structure. However, the new report said, the blemishes, deposits and discolorations had not gotten significantly worse in recent years. Indeed, the new report also notes that the structure showed blemishes and markings when it was fabricated by Pittsburgh-Des Moines Steel, of Pittsburgh, in the early 1960s. A WJE engineer inspects the Gateway Arch surface in October. Some of the surface markings and streaks date to construction 50 years ago, WJE found. "This research revealed that throughout the fabrication and construction of the Arch, the appearance of the stainless steel panels was under discussion by the parties involved in the construction," the report said. "The contractor was unable to fabricate and install pristine stainless steel panels, leading to further discussions on how to repair, refinish, and clean the panels, even while the monument was under erection." In a letter July 22, 1966, to the National Park Service, architect Eero Saarinen and Associates noted surface defects from suction cups, scaffolding and other abrasion on the stainless steel skin. A protective coating for the entire exterior would have cost just $86,589 at the time, Saarinen's firm noted. But the coating, although economical, would have not helped protect the structure from nicks, scratches and dirt, the architect said. Painters apply protective coatings to the Arch's carbon-steel interior in 1966, a year before it opened to the public. The stainless-steel exterior skin was never coated or cleaned. Saarinen's firm also noted that Pittsburgh-Des Moines had already repaired some damage to the structure and recommended that the government accept the structure as it was. Cleaning could help with some of the appearance issues, but trials conducted last fall by WJE showed that some methods worked better than others—and some actually did more harm than good. 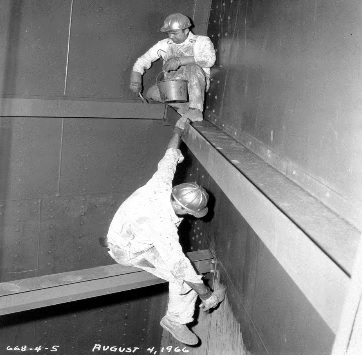 Cleaning with abrasive techniques caused "further visual anomalies" while chemical cleaning effectively removed the superficial corrosion, WJE reported. "Particular care is needed with cleaning processes, as it is possible that chemically cleaning selected areas of the Arch may cause any remaining discoloration to appear more pronounced," the report said. After a detailed structural inspection last fall, WJE concluded: "The exterior stainless steel of the Arch is in serviceable condition, without significant structural distress or deterioration." Deposits caused by atmospheric pollutants could increase over time, the report noted. It also cited the need to repair some isolated cracked welds, and to step up security against would-be graffiti artists. Going forward, significant atmospheric or environmental changes could accelerate corrosion or deposits, WJE added. "Annual visual monitoring of the stainless steel skin using high-powered binoculars, including photographic documentation, is recommended to document visual changes to the stainless steel surface," the report said.